As you may know, I work for the Y. Working down the hall from a weight room, treadmills, ellipticals and even group exercise classes, you’d think I’d be in fantastic shape. Um, yeah, not so much. After finally getting some relief for my poor sinuses, I decided to start out my exericse regime with a beginning yoga class. Our yoga instructor has been trying to get me to his class for months now and since it was his birthday yesterday I joined a handful of my staff and we all attended his class. Now, I definitely had some preconceived notions about Yoga. I expected incense and all sorts of metaphysical mumbo jumbo while hearing how my chakras were being aligned. I also had a little fear of being the only guy in the class and not being able to get into any of the positions. I was the only guy in the class. And let’s just say my groin and hips just can’t compete with those who are biologically predisposed to giving birth. And lets just say that if I knew I was going to be barefoot the entire time, I would have at least cut my toe nails. But once I got over my insecurties, I gave it my all. I contorted and twisted and strained all while trying to remember to breathe (breathing is a big thing in Yoga). I did find out that my hamstrings are a good six inches shorter than I remember them being and my calves just don’t want to see my heels touch the ground while practicing “downward facing dog.” But I survived. Lower Abdominals? Yep, them too. Okay, my whole body hurts. But, hey, at least my chakras are aligned. You can’t put a price on that. I knew it would happen someday. I knew that one day, Swee’Pea would walk through the door and announce that she had found someone. In my mind this would happen sometime around the year 2035. But it has already happened. Swee’Pea has found a man. And not just any man. He’s muscular, handsome, and a career man. He’s a bit stiff but perhaps he’ll warm up. When I ask him questions, all I get is his name, rank and serial number. I don’t want to cause too much of a scene, however, as the man is heavily armed. *Sigh* I guess it is my fault since I introduced them. You see, I thought he would be a good companion for TheMonk. But when I brought him home TheMonk looked up from his Lightning McQueen car and just shrugged. Swee’Pea, however, took an instant liking to this military man which makes a father a little nervous for the years to come. I do have a few tricks up my sleeve, however. In fact, I do know some people who know some people so I think Mr. G.I. Joe will have to go permanently MIA. Seven years ago, I stood at the altar looking up the aisle towards the back of the church, feeling nervous and excited all at once. Suddenly, a vision of beauty appeared and took my breath away. Little did I know that this was, truly, just the beginning. At that moment I had no idea how much our relationship would grow and mature. I didn’t know how much better our relationship could be. I didn’t know that we would someday look at each other in wonder while watching our beautiful children play before us. Seven years. Seven wonderful years. I love you honey. Thank you for marrying a guy like me. And I can’t believe it’s been a week since the birthday party and I have yet to mention it. The party was a nice size. A few neighborhood friends joined Grandmother, Grandma, Grandpa and our niece Adelia. The day was exhausting but worth the effort. I’m not sure if we could have survived without the family members who all chipped in. Those of you reading this, you’re invited every year! The stars of the show, besides Swee’Pea and TheMonk, were their individual birthday cakes. Mommy conceived the idea of doing personalized birthday cakes for Swee’Pea and TheMonk. Right now, Swee’Pea loves kitties. 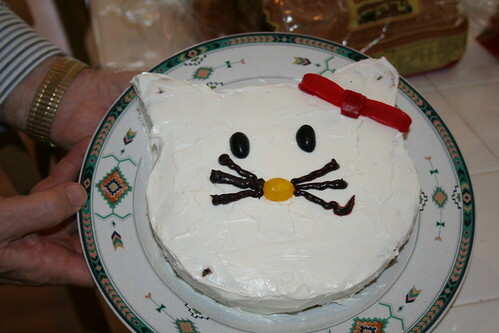 So, Mommy decided to do a Hello Kitty cake for her. TheMonk loves cars and trucks right now. 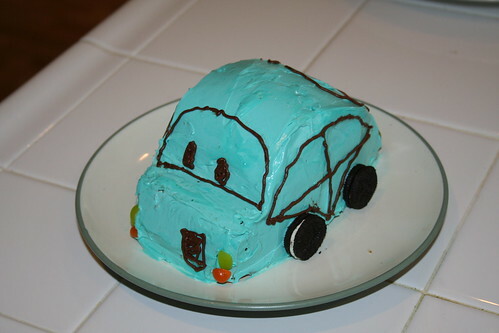 So, Mommy decided to make TheMonk a car cake. I got to help by shaping both cakes to make them look like a kitty and a car. Mommy did the rest. The results were fantastic and Swee’Pea and TheMonk are still talking about their “kitty cake” and “car cake”. So far, two years old has been really fun. A lot more time outs but a lot more talking and laughing too. Here’s to a great third year! 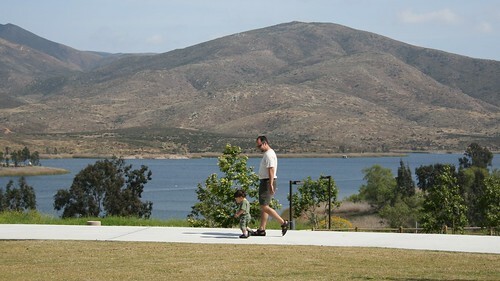 This past father’s day, I had the honor of collaborating with my fellow blogfathers about what the meaning of fatherhood is to me. In my little section, I opined that “diaper wipes are the single most utilitarian tool outside of duct tape.” That got me thinking, what are the many uses of diaper wipes? So, while sitting here in front of my new Flat Screen HDTV (Thanks Honey! ), I’m gonna list as many as I can think of. Here we go. Okay, that’s a good list. What else can you think of? And the way they say it, especially TheMonk, in an exasperated, “MY GOD, LOOK AT WHAT EMINATED FROM YOUR BEHIND!” tone of voice is what makes it truly so very funny. Of course we assumed that the twins were mimicking their daycare provider’s reaction whenever she changed their diaper. But when we asked her about it, she thought it had come from us! Of course, now, I’m doing it all the time – just to hear them say “Oh, Maa-aaaan!” with their legs in the air as we exchange a clean pair of Huggies for a soiled one. [UPDATED] My friend at Rattling The Kettle has correctly pointed out that my kids are watching too much Dora. We do not watch that here. Daycare provider… busted! It’s Father’s Day eve and I sit in the living room listening to Swee’Pea and TheMonk argue over the baby monitor about who’s Daddy I am. “NO! MY DADDY! !” retorts Swee’Pea. “No! MY Daddy!” Shouts back, TheMonk. “AAAAAAHHH!!! NOOOOoooooo… MY Daddy! !” Cries Swee’Pea. And then she bursts into tears. Swee’Pea smiles. I look over at TheMonk and he smiles as well. I go over and give him a soft stroke of the cheek and hand him his stuffed Monkey. He tucks it under his arm and starts to get comfy. I smile at both of them, now content and ready for sleep. I’ve been a father of 2-year-old twins for one whole day and I have already gained wisdom. Being two is not about being unhappy. It’s about being unhappy and letting everyone within a five mile radius know about it. Being two is telling daddy in the saddest voice that she can’t find “fishy” – a toy that she was very attached to the day before. After spending 15 minutes searching high and low to be the hero for your little girl, you finally find “fishy” and triumphantly present it to your little girl while fully expecting the biggest smile in the world and perhaps a huge bear hug. Instead, when seeing “fishy” she shrugs her shoulders and turns to play with another toy. Apparently “fishy” was sooooo 10 minutes ago. Being two is deciding you don’t want to wear those shoes. No, you want to wear the other shoes. THE OTHER SHOES!!! (Other shoes are produced.) On second thought, I do want those shoes. The “terrible” twos, huh? Why do I get the feeling that having two two-year-olds is going to age me a couple of years myself? Hello my little two year old girl. Two years old. Wow. I cannot believe how fast the time has gone. When I reflect on those first days of your life and how even then you had my heart wrapped around yours, I cringe to think how fast this is all moving. I have so loved being your daddy and I would just like it to slow down a little bit. You see, my little girl, for as long as I could remember, I have wanted you. Not just any girl, mind you. No, I wanted you. I wanted a little girl who is so sweet she’ll help her brother up after he’s fallen or give him hugs when he’s not well. And I wanted that little girl who is so independent that she wants to do everything by herself – even when it means being totally frustrated. I wanted that little girl who is so passionate that she’ll dance in the middle of the room or scream when things don’t go her way. I wanted the beautiful little girl whose inner beauty shines just as strong. I wanted, and got, you. You have transformed so much since those early days. In those days we thought that you were the quiet one. The gentle soul. The one who takes it all in without speaking. My how we were wrong. We were wrong because you are too complex to pin such a narrow view. For example, you definitely like to talk – but only when you are comfortable in your surroundings. You will spend an entire hour and a half of “nap” time talking non-stop but trying to get you to say hello to a stranger is an exercise in futility. Yes, you are complex. What you see on the outside isn’t what you’ll get when you dig a little deeper. I love that about you. My favorite moments of being your daddy are classic “daddy’s little girl” moments. For example, I love it when you hold my hand as we walk up the steps to daycare. I love the way you say “Hi… Da-ddy” drawing out the words in a way that implies pure love and affection. I love the hugs you give me for no apparent reason other than to express your feelings. I love your goodnight kisses. I love those precious few moments when it’s just me and you and I can tell how very much you love being alone with your daddy. It makes me feel special. And it is all going so fast. I try not to think about it but I cannot help but think that before I know it, I’ll be watching you go to the Prom or watching you walk down the aisle and it makes me want to hold onto my little girl and squeeze. I want to squeeze all the pure joy of little Swee’Pea into my heart and keep it there for eternity. I want to always remember what it feels like to nuzzle your soft cheek with my nose as we descend the stairs each morning – knowing that this will most likely be the only time I’ll have alone with you all day. I want to remember all of this because before I know it time will have moved on. You are two years old and you’re already fine tuning your tantrum. Just today you were in rare form because I didn’t give you enough warning before ending our coloring activity. You, my little one, are full of passion – even when throwing a tantrum. Just take it easy on good old Dad, okay? 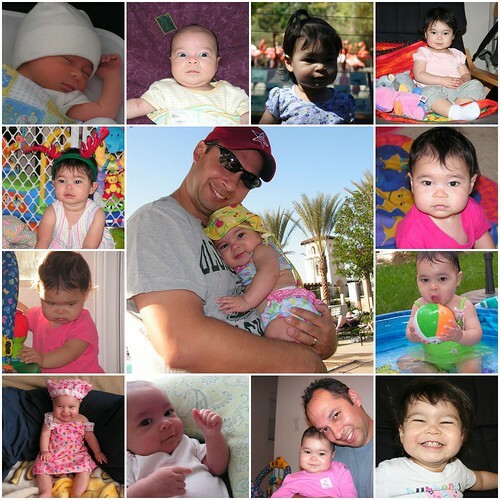 Happy Birthday, my precious Swee’Pea. I love you with all of my heart. Well, buddy, I can’t believe you are two years old today. The past two years have flown by. It seems just yesterday that I would take you out of your bassinet in the middle of the night as you fussed away and lay you on my stomach and kiss your soft, warm head in the cover of darkness. It seems like yesterday that I would listen to your short, little breaths at 3:00 a.m. and wonder how wonderful having a son was going to be. It was on those nights that I would look at your angelic face highlighted by the street lamp outside our window and think ahead to what lay in front of us. But even then, I couldn’t have imagined the last two years. I just want you to know that I love being your father. As I think back on the past two years I am struck by what a good soul you have. It is the quiet moments when I see you most as you. I hope I never forget the moments after a nap when you sit across my lap on the couch eating cheerios and drinking juice. We never speak but the looks you give me with your beautiful brown eyes make me feel more connected to you than at any other time. It is these times that I thank God for giving me a son. You were late to the walking and talking, my little man, but my how you’ve made up for lost time! You have mastered the playground with slides, suspension spans and all types of steps. You talk to everyone who will listen, and you can even carry a pretty good tune. You are such a smart little guy with a very inquisitive nature. Just yesterday you noticed the drawers in the kitchen had wheels to facilitate opening and closing them. You pointed this out to me and then studied how they worked. That is so much like you. In fact, I have taken to calling you “my little engineer” as you are often fascinated by how things work. Lately, you’ve come to say “Hi Daddy” when you see me for the first time. I love hearing those words, buddy. 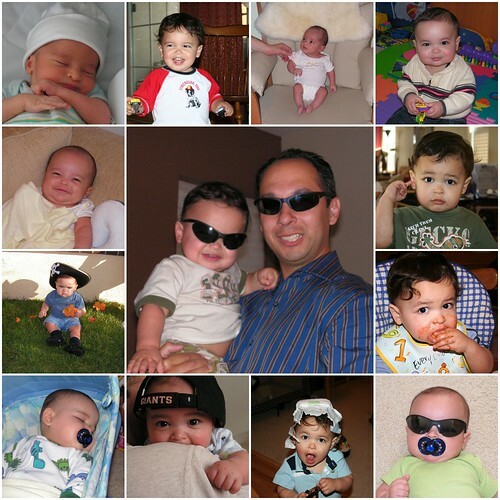 Thank you for being such a great little boy and giving this father such joy in raising a little boy. You are beautiful in every way my little Monk. I thank God that you were sent to me. The last two years have been way more than I could have imagined on those first sleepless nights. Every day has been a joy. Every. Day. I have so loved being your father. I just wish it would slow down. I blinked and somehow two years have gone by. Happy Birthday my precious little boy. I love you.